I spent some time yesterday at an event that I would have never thought of going to before I started exploring our family lines a number of years back. 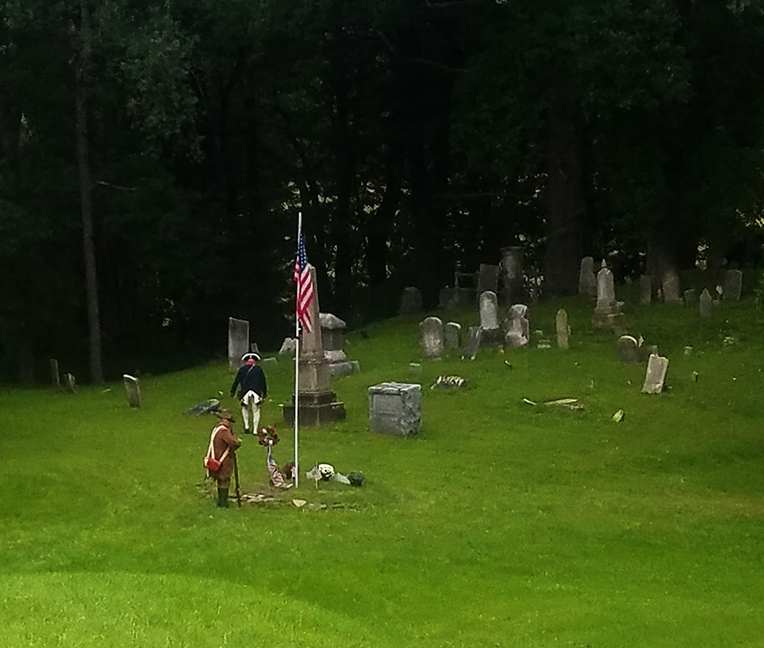 This was the dedication at the Colonel Lindsley Burying Grounds in Lindley, NY by the Daughters of the American Revolution (DAR) of a plaque honoring the service of an ancestor, Samuel Lindsley. I believe he is my 6th or 7th great-uncle. Samuel was a young soldier in the Revolution fighting for his local militia out of New Jersey. After the war a number of his family members headed into the new western frontier and settled on a very large tract in a fertile valley containing the Tioga River in what now is currently the towns of Lindley and Presho. 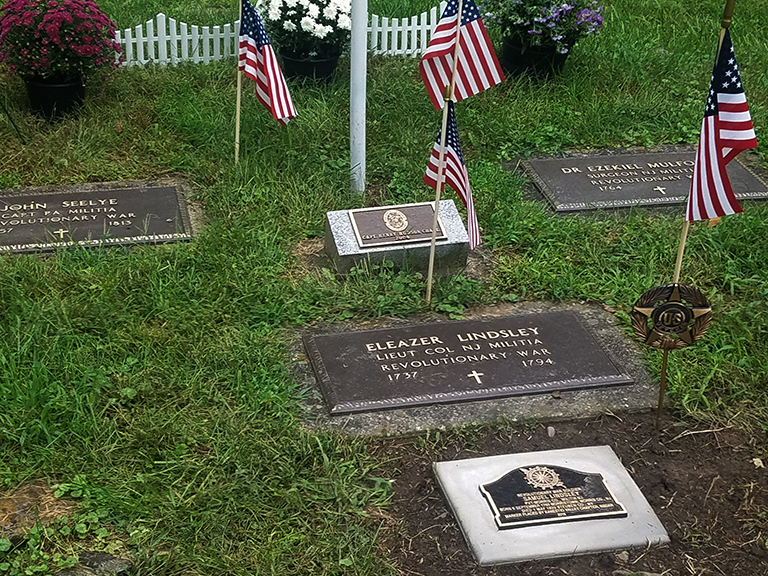 His father was a man I have mentioned here before, Col. Eleazer Lindsley. A bit on that later. I had no idea to expect when they invited me to attend this event as one of the Lindsley descendants. I thought it would be a group of 10 or 12 folks and there would be a few words then we would all take a look at the plaque, shoot a couple of photos and chat a bit. Done. But coming on the scene I saw signs for parking and men in Revolutionary era garb climbing out of their cars. It turned out it was a real event. 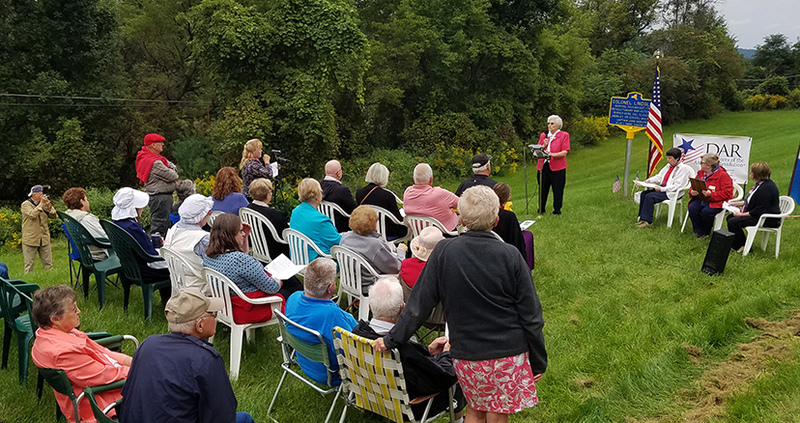 There were about 60 attendees, including members of the DAR, local historians and several direct descendants of Samuel Lindsley who came from as far away as San Antonio, Texas and Columbia, South Carolina. There were also members of the Sons of the American Revolution in full period garb. 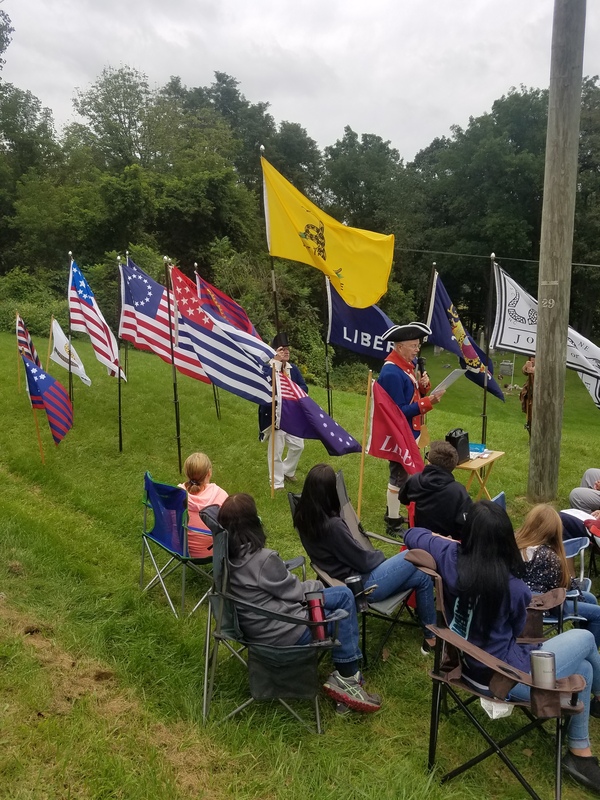 One brought a part of his collection of Revolutionary era flags and gave us a lesson on the history an meaning of each. They then proceeded to raise their muskets and give a resounding salute to honor Samuel. There were several speakers including Kitty Pierce, the Lindley town historian who is a walking encyclopedia of the genealogy and history of that town. Another speaker was Phil Cirulli, who is a direct descendant of Samuel and whose research and persistence was responsible for the event. Phil, who now resides in South Carolina, told abut his journey in getting Samuel this recognition, about the long process involved in attaining documents and certification. Our paths have crossed a number of times while doing our respective genealogy so it was great to meet and talk with Phil along with a number of other newly discovered distant relations. I wouldn’t have been at this event if it weren’t for a painting I did a couple years back. It was from my Icons series which were my imagined images of how I thought some of my ancestors might look. There was no research or source material. Pure imagination. One was of Eleazer Lindsley, the patriarch of the Lindsley family that came to this area around 1790. The blogpost about Eleazer, a most interesting character, came to the attention of historian Kitty Pierce and soon spread to Phil and other members of the family. I was surprised how many people mentioned the painting. But even more surprising was that upon meeting Phil, I saw a striking similarity between Phil and my imagined image of Eleazer. 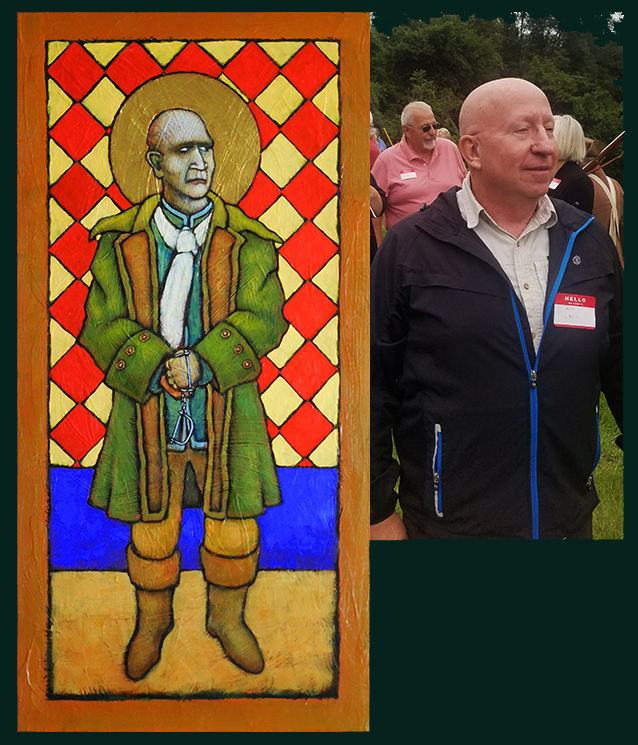 Similar bald head, similar nose and chin. Even the ear looked familiar. Here’s a photo so that you can make your own determination. All in all, a most interesting event and one that further confirmed my ties to this area and this land. It was pleasure to meet these folks and send them good wishes from their newly found distant cousin. For this Sunday music, I have fittingly chose the song Ode to My Family from The Cranberries. Have yourself a good Sunday. The more I read about this ancestor,the latest entry in my Icon series, the more interesting I find her. Her maiden name was Tacy Cooper and she is my 10th great-grandmother, born around 1609 in England. Little is known of her parentage or when exactly she came to America but she is known to have lived in Dorchester, near Boston in the Massachusetts Bay Colony in the early 1630’s. At the time, the Colony was strictly ruled by the Congregational Church and its precepts. Very puritanical, of course. Many of the settlers who were coming into the colony sought more religious freedom than was being offered and under the influence of Roger Williams, set out in 1634 to leave the Colony and establish a new community outside its boundaries. They sent out a party of scouts who chose a site on the Connecticut River below present day Hartford. Soon after, a group of about 100 people set out by foot for this location. Among them was Tacy Cooper and her future husband, Samuel Hubbard. They met during this journey and Samuel later wrote that Tacy was the lone bright spot in the whole undertaking. Although the heavy goods for the community had been shipped by boats from Boston up the river, it was a harsh trek. Many of their provisions had also been shipped and their trip was ill-timed. By the time of their arrival, a bitter winter had set in on them and the boats had not arrived nor would they arrive in the future. Without those provisions, a number of this group died that winter and those who remained survived on acorns, malt and grain that had brought along as seed for future crops. To make things worse, the Pequot Indians were attacking as they tried to stem the spread of the settlers into their territory. But they persevered and in 1636, Tacy and Samuel were married. However, the religious freedom they sought did not come to bear in this new community. Samuel spoke up in protest to the role of the Church Elders in the local government and was driven from the community along with several other families who were in agreement with him. They fled south, settling in the area now known as Springfield, Massachusetts. They thought they were outside the boundaries of the Massachusetts Colony but in subsequent years, the provisions of the settlement of the Pequot Wars brought that location back into its realm. In protest, Samuel and Tacy became Baptists. In the following years, Baptists were banished from the Colony and, after many threats, they fled once more, this time to Rhode Island where they were reunited with Roger Williams. They lived peacefully there for many years as members of the Baptist Church but it didn’t end there. In the mid 1600’s, a movement had began in England– the Seventh Day Baptists. While they were almost exactly the same in their beliefs as traditonal Baptists, they observed their sabbath on the seventh day, Saturday. In 1665, Stephen Mumford moved from England to Rhode Island, bringing this new sect with him. He spoke of this beliefs to Tacy and Samuel and a few other members of the First Baptist Church of Newport. It was Tacy alone who first chose to join with Mumford in observing a seventh day sabbath. Soon after Samuel and four other joined them and they formed the first Seventh Day Baptist church in America. Tacy is considered the first American founder of the church. The Seventh Day Baptists exist to this day and were a big part of my mother’s line for almost two hundred years and six generation, although I am pretty sure she would have not been aware of this fact. While I am not a religious person in any organized sense of the word, I still find it fascinating in the way religion has shaped much of my( and just about everybody else’s) past. I am pleased that Tacy was such a strong woman. She was the one who stood and answered the Church Elders when she and the others were made to account for their desire to break from the Baptist Church. She went before the congregation and with “great clearness and force” outlined their reasons for departing. I can’t help but think that this must have been a rare moment in early America– a woman speaking to power. This may not be the best painting of the Icons but it moves me in the same way. I always hope to find something in these stories that I can take for my own life and I can only hope to one day have Tacy’s strength and conviction.